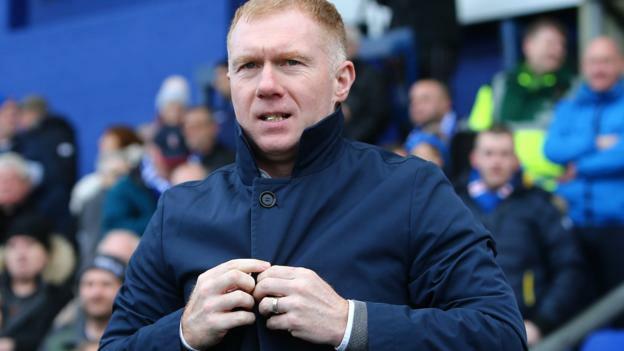 Former Manchester United and England midfielder Paul Scholes has left his role as Oldham Athletic manager after just 31 days. The 44-year-old took over on 11 February and was in charge for just seven games, winning only one. Scholes said in a statement that he had taken the decision with “great regret”. “It unfortunately became clear that I would not be able to operate as I intended and was led to believe prior to taking on the role,” he continued. Scholes took over with the Latics 14th in the table and leaves with them in the same position. His final game as boss was a 2-0 defeat against league leaders Lincoln on Tuesday. “I hoped to at the very least, see out my initial term of 18 months as the manager of a club I’ve supported all my life. The fans, players, my friends and family all knew how proud and excited I was to take this role,” he added.